You may wonder what the the 1989 film, "Steel Magnolias," has to do with cookware. Well, it may be a stretch, but this will give you some insight as to the strange way my mind works. Being from the South, I enjoyed the movie and those funny and tough characters in it. When reading about the qualities of stainless steel cookware - it's beautiful, it's durable and lasts a lifetime - a mental association with those strong women characters just sort of happened in my brain. No matter what those characters went through, they endured it all and came shining through. Maybe I'll have to give nicknames to some of my cookware for those actresses: Dolly, Julia, Olympia, Shirley, Sally and Daryl. Now that would make a really nice 6-piece cookware set! Ok, I already admitted it's a far-fetched association. But whether you see the connection or not, stainless steel cookware has some benefits for chefs and cooks. For metal to be called stainless steel (an iron alloy), there must be a minium of 11.5% chromium in it. Stainless kitchen utensils or cookware is usually a blend containing 18% chromium with either 8% nickel - called 18/8, or with 10% nickel - called 18/10. The main benefits of this kitchen equipment is that it does not corrode and it won't change the flavor of the food you are cooking (it doesn't react with foods). This is especially important when cooking high alkaline or acidic foods. 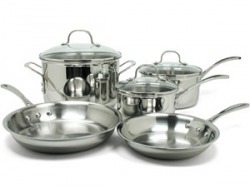 Another main plus for stainless steel cookware is that it doesn't dent or scratch easily. Well, did I get your attention with that title? What it probably should have said is something like: stainless steel needs to be combined with a more conductive metal. But, since that was boring, I used the more outrageous title you see above. There are some drawbacks to stainless steel cookware that I wanted to mention. For one thing, it doesn't heat as evenly as some other types of metals - another way to say that is it's a relatively poor heat conductor. This is why the better stainless steel cookware is layered with other metals, such as aluminum. Aluminum's light weight and good heat conductivity makes it one of the choices for layering in between an outer and inner surface of stainless steel. This is often called tri-ply in the cookware world. A good example of this blend of materials is Calaphalon's Tri-Ply cookware. 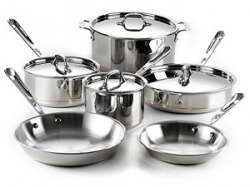 Calphalon gets high ratings from consumers for it's quality cookware products. See example product below. The meticulous craftsmanship whereby three layers of two metals are used in Calphalon Tri-Ply Stainless cookware makes this a high-quality choice for chefs and cooks. Surgical quality 18/10 stainless steel is layered inside and outside the heavy-gauge aluminum center layer which provides the even, efficient heating and precise control needed for reliable cooking results. Using stainless steel on the outside provides the lustrous beauty and reflective cooking surface many chefs prefer. This cookware is oven and broiler safe and is safe for glass/ceramic stoves. Another variation on the theme of layering stainless steel with more conductive materials is done by using copper and stainless steel. Using stainless steel and copper layers produces the best of both worlds - this cookware will be more expensive, though. Copper is the best metal for heating evenly and is the best for high-heat, fast-cooking techniques such as sauteing. Copper and stainless combined makes for a longer-lasting cookware. These copper core pans resist scratches better than the all-copper pans. A well-known brand that has created excellent copper core pots and pans is All-Clad. They seem to be the top brand for this kind of layered cookware, having gone beyond a three-ply method to create as much as five-ply cookware (with stainless steel and copper layers). You can see by the product example below that the cost is quite a bit higher when adding the copper and the extra layers (and in this example, the product is discounted - the price was $1,604.95 but has been reduced to $1,199.99 for a limited time). This five-ply invention seems to be the "rolls-royce" in cookware and the extra cost is necessary for gourmet chefs and the most demanding cooks to ensure the success of their culinary creations. The downside is that this is not recommended for use with induction cooktops and handwashing this type of kitchenware is recommended. This is the new 10-pc. Copper-Core set from All-Clad, a line that features bonded five-ply construction. Combining the cleaning ease of stainless steel with the superior culinary performance of copper creates an excellent cooking utensil. The copper at the center of each piece guarantees maximum and even heat conductivity while the 18/10 stainless steel cooking surface is a joy to use. Copper-Core is for true cooking connoisseurs, and this set provides the key pieces for maximum culinary utility. Looking at the glamorous, lustrous, beauty of these cookware sets, I still think of them as "Steel Magnolias." They really are the stars of the gourmet cookware industry! Next in this series of cookware reviews is Cast Iron Cookware Tips.